Learners in Alberta would continue to have affordable tuition and fees and better access to post-secondary opportunities because of changes proposed in An Act to Improve the Affordability and Accessibility of Post-Secondary Education . Minister Schmidt celebrates tabling An Act to Improve the Affordability and Accessibility of Post-Secondary Education. If passed, the act would amend the Post-Secondary Learning Act to implement the province’s revised tuition framework. 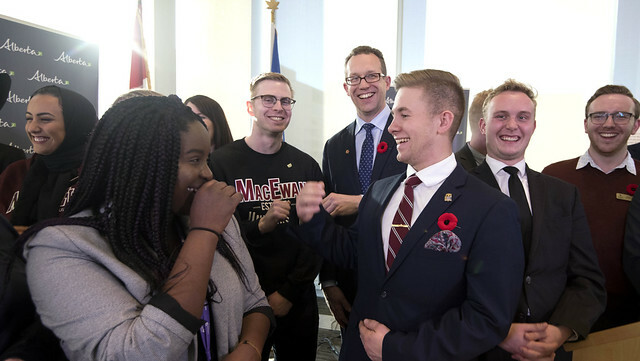 For the first time in Alberta’s history, the minister would be able to regulate tuition and mandatory non-instructional fees to ensure fairness and predictability for students. The new framework would also ensure that students have a greater voice in decisions that impact their education. Cap each institution’s average tuition and apprenticeship fee increases to the Consumer Price Index. Provide increased predictability for international students. Allow the minister to regulate mandatory non-instructional fees and international student tuition. Empower students to have more say over exceptional tuition and fee increases. To help more students afford a university or college education, government is also extending the tuition freeze for a fifth consecutive year. University students taking an average-priced program would save almost $2,000 on a four-year degree. Confirm Alberta College of Art and Design’s transition to a university. Allow colleges, including Red Deer College and Grande Prairie Regional College, to transition to university status without future legislative amendments. Better define the mandates of the institutions in order to continue to encourage collaboration and innovation across the system. Ensure there are at least two student representatives on the boards of each public post-secondary institution. All the proposed changes are the result of consultations with students, faculty and staff. The consultations involved an online survey, which received over 4,000 responses, and a number of focus groups. If passed, the changes to the Post-Secondary Learning Act would be effective Feb. 1, 2019.